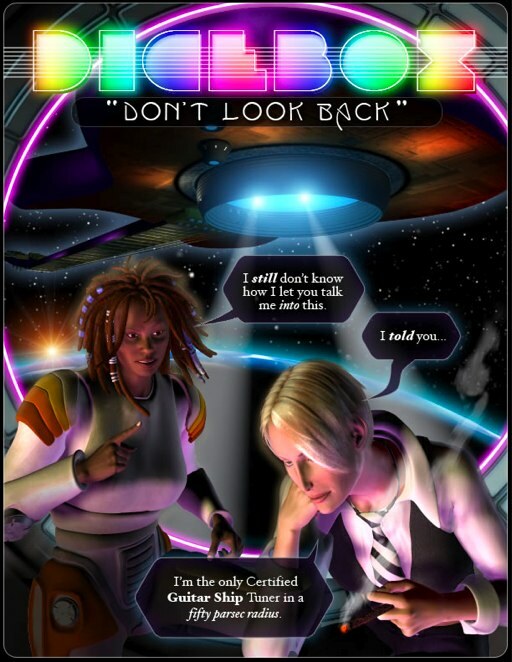 Patrick Farley (of Electric Sheep Comix) has a new work up: Don't Look Back, a gorgeously illustrated and witty slice of neon-lit 1970s prog-rock sci-fi futurism. It's a combination of distinctly retrofuturistic zeitgeists (prog rock/art, stories of spaceships, the freaks-vs.-straights dichotomy), gloriously rendered, and could be described as being like Illuminatus! meets the Hitchhiker's Guide to the Galaxy with artwork by Roger Dean. It's a work in progress (only two parts are up so far), though keep checking back. The latest instalment of Patrick Farley's mega-doovy webcomic Spiders is up. It's set in the parallel universe where a forward-looking, technologically savvy Gore administration (!) wages war against terrorists with open-source distributed robots and Ecstasy bombs -- only it gets weirder than that. 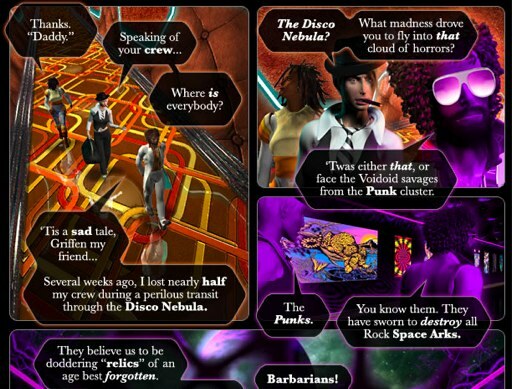 The visuals are amazing, making full use of the web, and referencing everything from Illuminatus! to Fight Club to rave culture (though mostly in the visual style). And it doesn't use one jot of Flash -- it's all inline images. Don't miss it. The latest webcomic from e-sheep, the creators of the excellent The Man Guy I Almost Was and Delta Thrives: The Spiders, set in an alternate universe where the dot-com golden age never ended, and a humanist west under an idealised Al Gore fights the Taliban with open-source robots, benevolent AIs and Ecstasy-laced marshmallow drops. It's a sort of cyberhumanist utopian war on terrorism, diametrically opposed to Bush's secret government and ideology of Biblical Fascism and "total information awareness".